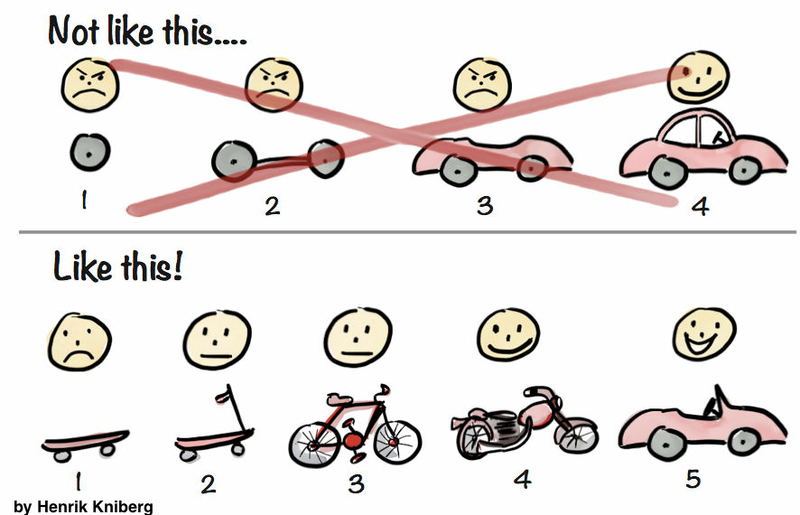 Your end product is the car, but your MVP is the skateboard. The skateboard is MVP because it’s the smallest thing you can make to get people from A to B. The car is the shiny end goal because it has everything you’re wanting to put into your product. The other day I was thinking, what would it look like to make an MVP for my own life? This would be an interesting approach to setting goals and working toward them. What would my “life MVP” be? It would be the habits and states of being that don’t create the perfect life, but hits the basics of what I want. It may not have all the frills of the best life but it’s sure getting there. My ideal life is one where I’m living simply but comfortably off of passive income, married to a beautiful and intelligent wife, spending my days learning and creating things, with a few close friends who I see regularly, and engaged in my church community. That is a very high standard to meet. In fact it might be impossible but for me it’s the life worth working toward. Yet because it’s so lofty I run the risk of never actually making a life that’s in a “good enough” stage along the way. And what good a life is that? Especially knowing I could die at any time, and my ideal life might be impossible. It makes sense to take a careful, iterative approach and make things incrementally better. So what might a life MVP look like here? The first stage MVP might be one where I’ve not yet even reached any of these goals, but instead am building the habits. So that first MVP could be me building a side hustle that isn’t yet profitable but is promising; putting myself out there seeking someone I’ve got chemistry with; finding what things I could see myself reading, writing, and programming about long term; having a couple friends I catch up with every couple weeks; and finding some small way to volunteer with my church. That’s the first MVP. It’s not all the bells and whistles, but it’s rolling. In the second MVP I’ve started turning a small profit, found someone pretty to date, am deeply learning about something and am expressing my creativity, I have a couple friends who I’m close to, and perhaps have some small leadership role at my church. From there, I iterate onward. This kind of life would allow me to have a base level of happiness while also bringing me to greater levels of happiness. From a psychological perspective we benefit from achieving short-term goals, and this system definitely gives you plenty of short -term goals to strive for. It’s also a morale booster to keep track of your successes and watch yourself grow into someone better. It’s the best of both words – getting your satisfaction now, while doing things that make life even better the further you go on.